Auston Matthews, who many project to be the No. 1 pick in the 2016 NHL Draft, is playing for Zurich in Switzerland's top professional league this season. Matthews currently is playing for the United States at the 2016 IIHF World Junior Championship in Helsinki, Finland. NHL.com will follow his journey leading to the NHL draft this season with a weekly update. United States center Auston Matthews always has been coy about discussing what it would be like to be chosen No. 1 at the 2016 NHL Draft in Buffalo, N.Y.
His parents, Ema and Brian, are taking the same approach. NHL Network caught up with them in Helsinki, Finland, at the 2016 IIHF World Junior Championship. "I don't think we think about the draft too much because it's so far away (June 24-25)," Brian Matthews said. "We're kind of just focused right here in the moment and with USA Hockey. Whatever happens at the draft happens. We'll accept whatever comes of it." With the way Matthews has been playing during the WJC, it wouldn't surprise anyone if he were the top pick. 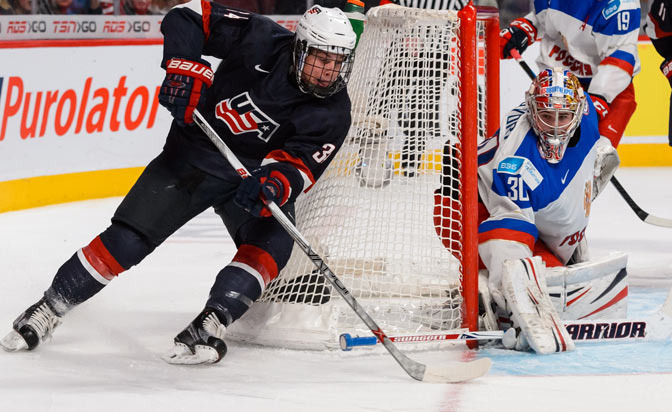 In 7-0 win against the Czech Republic in the quarterfinals Saturday, Matthews became the first player to score a hat trick for the United States in the WJC since Johnny Gaudreau (Calgary Flames) on Jan. 2, 2013. He leads the tournament with seven goals and is tied for third with 11 points. He's one goal short of tying the U.S. record of eight goals in one WJC set by Jeremy Roenick at the 1989 World Juniors in Anchorage, Alaska. Roenick finished with 16 points but the U.S. finished fifth; Mike Modano also was on that team and had six goals and 15 points. Russia, led by Pavel Bure, Alexander Mogilny and Sergei Fedorov, won the gold. Similarly, it's Russia that stands in the way of Matthews and the U.S. from having an opportunity to play for gold at the 2016 WJC. Matthews has five goals and seven points in the past three games. The semifinal-round game against Russia (1 p.m. ET; NHLN) will be played at Hartwall Arena. The winner will advance to the gold-medal game to play against either Finland or Sweden on Tuesday (1:30 p.m. ET; NHLN). Matthews has had great success centering the top line with left wing Matthew Tkachuk, an A-rated skater on NHL Central Scouting's November players to watch list, and right wing Colin White, a first-round pick (No. 21) in the 2015 NHL Draft by the Ottawa Senators. "Matthews and Tkachuk played all last year together [for USA Hockey's National Team Development Program under-18 team] so they get it," U.S. coach Ron Wilson said. "They understand where they are and actually have a similar game." Tkachuk is second on the U.S. with eight points (two goals, six assists). "Tkachuk can play in any situation and Matthews goes wherever the open ice is," Wilson said. "The question was finding someone to play with them. [White] is a great skater and he's fairly big too. He gets physical and I think that actually helps Tkachuk and Matthews get into their positions and get some space. The three of them all understand the game and I've been pleased with their production."